The Internet rumor mill is buzzing with noise ever since Microsoft announced that it would release an update for Windows 8 this year. Windows Blue, or Windows 8.1, is not a service pack according to Microsoft but a feature upgrade for the operating system. Windows 8 has been heavily criticized ever since first public versions were made available by Microsoft for testing purposes. Yesterday news leaked about a start menu button that Microsoft would add to the system again (after having removed it in Windows 8) and a desktop background that you could now also display on the operating system's start screen and not only the desktop. Microsoft revealed additional details and information about Windows 8.1 on a new blog post on the official Windows blog today. It is clear from the post that Microsoft will continue on the path that it has decided on. While this won't satisfy die hard critics of the operating system, it may please others who have not as many reservations. Microsoft confirmed that it listened to customer feedback and will introduce changes to the operating system as a response to the feedback. The blog post covers seven areas. Below is a short summary of the changes and additions announced in the blog post. Users can turn their PC or tablet into a picture frame by displaying a slide show of pictures on the lock screen using local or SkyDrive pictures. More colors and background will be offered, including some with motion. Desktop backgrounds can now be displayed as start screen backgrounds. The start screen will feature additional tile sizes, at least one large (double the size of a the largest tile size in Windows 8) and one smaller tile size (half the size of the smallest tile size in Windows 8) will be available. Multiple apps can now be selected at once to be resized, moved or uninstalled. It is also easier to name groups and rearrange tiles. A swipe from the bottom displays all apps and apps can now be filtered by name, date installed, use or category. New apps that you install are not automatically added to the start screen anymore. They appear under apps instead and are highlighted as new. The built-in search will return global search results (powered by Bing). It features new quick actions, like playing music or videos, so that you can do so right from the results. You can now scroll to the left to access local files, apps and settings results. Microsoft compares it to a modern version of the Windows command line. All built-in apps will receive an overhaul in Windows 8.1. 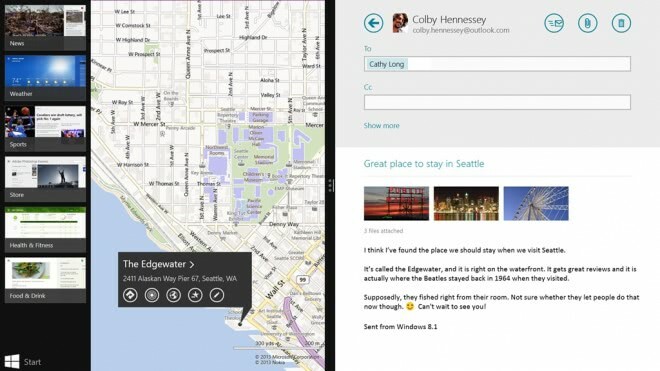 Microsoft will introduce new apps as well that it plans to introduce in future blog posts. New snap sizes will be made available so that you can for instance displays two apps next to each other with each app using 50% of the screen. Multiple windows of the same app can now be snapped together as well. Windows Store will feature an improved layout. App descriptions will offer more details and related apps will be shown here that you may be interested in as well. App updates install automatically in the background and through the store. You can save files directly to SkyDrive in Windows 8.1. The SkyDrive app provides you with access to files on your device and in the cloud, and also features offline access to files. If you log in with your Microsoft account, personalization takes place automatically (settings, apps, and so on). Microsoft promises that the new PC Settings menu gives you access to all settings on the device so that you do not have to switch to the desktop control panel anymore. Internet Explorer 11 will launch with Windows 8.1. The browser will offer better touch performance, faster page load times and other new features. Options to adjust the appearance of the modern IE11 to always show the address bar and open an unlimited number of tabs. Tabs will be automatically synced across devices. 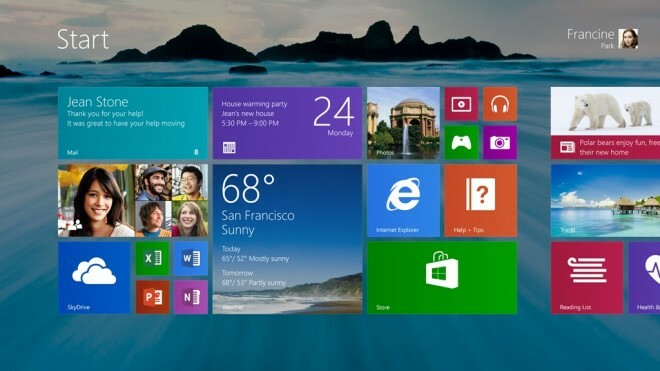 Windows 8.1 will introduce improvements for mouse and keyboard users (non-touch devices). This includes the start menu button that leads directly to the start screen. Options to change what the four corner actions do. Options to boot into alternate screens and not necessarily to the start screen. The majority of improvements that Microsoft announced today improve how you work with Windows 8. While it changes some of the shortcomings and features that have been heavily criticized, it does not touch others at all. The new start button for instance does not really do anything that you cannot achieve with a tap on the Windows-key and is not what many users expected Microsoft to add. It is interesting that Internet Explorer 11 will launch this year with Windows 8.1 as it usually takes Microsoft a lot longer to develop and publish a new version of the Internet browser. Several features that Windows 8.1 introduces make a lot of sense. I'm particularly interested in the new tile sizes, the global wallpaper, better app handling and the Windows Store improvements that Microsoft has planned. If you had hopes that Microsoft would restore the Windows 7 start menu then this is certainly disappointing news. No problem–there’s apps for that (Start Menu)! Hey, at least I won’t have to install another 3rd-party app to auto-boot to the desktop! If boot to desktop is included in the options. I don’t care about any of their cloud or tablet options, but I hope 8.1 will be a step back from their aggressive stance against users that they showed until now. Start button is back and it will run the “app list” when selected. What is that, the all apps page? Well this is most of what I had expected at first. Better late than never. They desperately needed a better way to organize the programs on the start screen, categories will make this much better for me, I may quit using the start menu button I put back. I just hope we can choose the categories or at least they put in enough to choose from. Looks like Win 8 has reached beta 2. I Hope they get it sorted by Win 10. Any news on Windows Server 2012? A “feature upgrade” not a service pack? Hmmm. Upgrades usually cost money, SPs normally don’t. I hope they don’t expect payment for this! They already mentioned that it will be free. Having been a long time Win 8 user and having supplied touch enabled desktops and laptops to a number of clients I can honestly say I still don’t see what the actual problem is. I was always a heavy start menu user but the start screen is the same really. I have used iOS and Android extensively, including my nexus 7, and they simply do not compare to Win 8 in features, form or function. The service pack with a clever name is a solid incremental upgrade that will hopefully silence irrational attachments to buttons. Microsoft need to ensure no products get sold without a touch screen and sort out netbooks being sold for 1000 euro and their OS will dominate. That’s all they need to do, IMHO. Hah, could have fooled me there. So it seems that MS has set another budget for astroturfers for this upcoming update. Expect post like this all over the web again. No kidding, anon. Remember all the comments on here promoting win8 before it’s release? I mean, I suppose we shouldn’t be surprised, it is a smart move that most companies have embraced. Sadly, I don’t think many people are aware of it. Have you ever watched your “clients” as they try to figure out how to log off or shut down their new Windows 8 box? Have you watched as they opened a file extension that now defaults to a Metro app? Were they impressed? Have you tried handing them a lamented list of keyboard shortcuts that weren’t needed with Windows 7 or a nicely laid out description explaining the hot corners, charms bar and ribbon explorer? What was their response? Also, what specific use cases are your “clients”? I’ve found that, musicians, book keepers, sales (they use iPads most of the time but need Office to file expense reports, update client and contact lists, etc on a desktop), marketing, grandmas and small business owners (construction and print shops) agree that Win 8 is pretty darn bad. Friends and family members with technical skill find it inferior. I am not entirely sure I should rise to the bait here, but ah well. On all of the Windows products from XP right through and inclusive with Win 8 there was an off button. The off button usually comes with a distinctive icon. It really is a rather handy button. I do not deal with home clients anymore as I do not have the patience.A number of accountants, building survey engineers and some training providers. Also installed/configured Office 2013 home and business is most cases. Incidentally, installing Office 2013 onto a computer with a dodgy internet connection is hell, but fine once the connection is stable. Opening menus and apps involve some minor slides of ones digits. The interface is really is very easy. 99% of the windows users in the world don’t use shortcuts. The ones that do use shortcuts only need to learn two new ones. Win + X and Win +i. The metro interface was built based on analysing all of the usage stats that win 7 recorded. I lamented the loss of the start menu but the start page is much the same and “prettier” in most cases to a messy desktop. Why do you and your clients find it so difficult? What is difficult about it? I really can’t understand it. Anybody who bought a windows 8 device without a touch screen is probably fairly stupid IMHO. If you re-read my most I mention something about that. Martin, Thanks for this clarifying article. Still with all these “improvements” I still believe its not a full worthy desk top operating system. I am still convinced its a phone or at best a tablet o.s.. This leaves me with one question do you know or Internet Explorer 11 will be available for Windows 7 users? I am not sure I thought I read in one of your articles that it does not? Microsoft has not commented on that, so, cannot say unfortunately. Anyone read anything about being able to run Modern Apps in a window? Snap improvements are welcome, but not the total answer. I’m loving what ModernMix can do for me, and would welcome native Win8.1 support. There is no more SkyDrive app. The sync functionality is built-in.